Westbrook & KD are both playing lights out! The Thunder’s season ended last year after game 5 of the NBA Finals. Anyone who watched that series immediately knew two things. First, Lebron James is the most dominant player in the NBA and the current king of basketball and secondly, the Thunder would be right back in the finals for years to come. The tears and frustration that came with losing would fuel the Thunder to continue their growth. Every fan of any team in the Western Conference kissed their dreams of a Finals appearance good-bye (except stubborn Lakers fans with their newly assembled super-team). With Kevin Durant, Russell Westbrook and James Harden, the Thunder just had too much potential. They had three all-stars under the age of 25, including the best scorer in the league. Then came the Harden trade and everyone who was not a Lakers or Heat fan collectively sighed, as it seemed obvious that one of those two teams would win the 2012 title. In the age of the super teams, the idea of trading away an all-star seems like it belongs in one of those AT&T commercials involving spastic little kids asking if three is better than two. Three all-stars must be better than two! Who was going to take over for Westbrook when he went through his shooting funk? Who would come off the bench to keep the scoring going? How would the Thunder compete against the super teams of the league? The Thunder have answered all of these questions through their play this year and are looking like one of the most complete teams in the league. If you look at any power rankings on any site, odds are the Thunder are in the top spot and if not, find a new site. The Thunder are off to a NBA-best 30-8 start while putting up a second-best 105.11 points per game. Most impressive about their team play is that they have a league-leading +9.16 point differential per game. Not only are they beating teams, they’re dominating them. So how is an offense that loses one of its main offensive threats doing this? It involves multiple reasons but it starts with Durant. While Kevin Durant is not leading the league in scoring at the moment with 28.9PPG, his shooting percentages are 52/40/90. A shooter can’t get more offensively efficient than being part of the 50/40/90 club. If Durant can keep this efficiency up, he will join Steve Nash, Larry Bird, Mark Price, Reggie Miller and Dirk Nowitzki in this exclusive fraternity of sharpshooters. While everyone knows that Durant can score, he’s spent a good deal of time improving other facets of his game this year. Durant is currently averaging career highs in assists (4.2) and blocks (1.7), while grabbing a solid 7.6 rebounds per game. It’s scary to think of the level Durant can reach. In the past year, Durant has played in the finals, improved his game immensely the following season, and even starred in the feature film Thunderstruck! He’s having an MVP campaign and the ceiling seems non-existent. However, Durant is not doing everything by himself. Westbrook is putting up a stellar 2012 campaign as well. Against the Phoenix Suns on Monday, the duo combined for 77 points and Durant introduced Marcin Gortat to Perkins and Mozgov in the ‘Embarrassed/Posterized 7-Footers Club’. Westbrook is having one of the best seasons of his career and has really stepped up in the absence of Harden. Not only has he stopped going into those funks where everyone yells “Westbrook! What are you doing? !”, but he is averaging career highs in multiple categories. Westbrook is logging career highs in minutes (36.1), 3- point attempts (4.1), 3-point percentage (35.7%), rebounds (5.3), assists (8.4) and steals (2.1). While we all know Westbrook can put up 30-plus points on any given night, with his improved ability to get surrounding teammates, he can contribute immensely even when his shot goes cold. Critics of Westbrook won’t be able to find a problem with his current game, but at least they’ll always have his wardrobe. The entire Thunder team’s improvement cannot be denied. With the departure of Harden has come the emergence of Serge Ibaka. While Ibaka has long been recognized for his blocked shots, even been referred to as ‘Iblocka’, he has evolved into a top power forward. He’s shooting a career-high 56% from the field along with 79% from the line. Throw this in next to career-high 8.4 rebounds and 14.3 points per game and it’s evident that Air Congo has taken off. What is most impressive is that he’s done all this while being the fourth option behind Durant, Westbrook and Kevin Martin. By improving both defensively and offensively and transitioning into a versatile power forward, the Thunder still have three elite players under 25 despite losing Harden. One of the biggest reasons we have not seen a fall off from the loss of Harden has been the smooth transition of Martin into the Thunder offense. It can even be argued that the loss of Harden and introduction of Martin improves the Thunder offense. Martin is averaging 14.9 points per game, but more importantly is the role he plays in the offense. Martin is a catch-and-shoot player, he doesn’t demand the ball like Harden. If Martin doesn’t have the shot, he dishes it back to either Westbrook or Durant. One of the most frustrating moments for Thunder fans is when Durant doesn’t have the ball in his hands when he clearly should. By removing a player with a style of play that demands the ball and introducing one who simply catches and shoots at a consistent rate with solid production, the ball goes to Durant more. And with Durant playing at the efficient level he is, you want the ball in Durant’s hands. I think we can safely say that every member of the Thunder, from the coach to the players, are doing everything in their power to ensure they’re smiling instead of crying when the confetti falls in the NBA finals this year. They seem to have taken the slogan ‘Thunder Up!’ to heart, as entire team has upped both its production and expectations. The Thunder are young, fast, talented, and hungry and expect nothing less than an NBA championship. Astraphobia is the fear of thunder, and every NBA team should develop it. 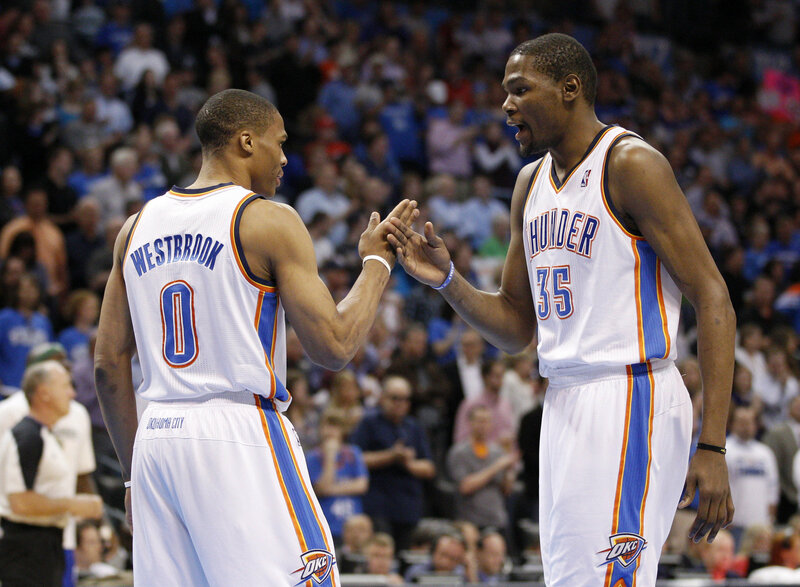 Only halfway through the season the Thunder look like a championship team, and expect to see them back in the Finals.